If you decide to move house the benefits of the PV system will usually be passed on to the new owners. You may expect this ongoing value to be reflected in the sales value of the property. If you feel that this is not the case then it is possible to move the panels to a new location. However, whether it is financially viable will depend on the circumstances and it is also not possible to take any Feed-in tariff with you. Tariff payments are usually linked to the property, and not the occupant. As part of the MCS requirements for a PV system it is necessary to install a Total Generation Meter (TGM). This allows the production of electricity (kWh’s) to be recorded and the generation of the system to be metered. An export meter or smart meter can be installed to identify how much “unused” electricity has been exported back onto the national grid. These meters are not yet mandatory for smaller (<30kWp) systems but smart metering is likely to be rolled out nationally over the next few years. Does having solar PV mean I don’t have any electricity bills? As your PV system uses daylight to generate electricity it can only produce power during the day. You will still need to buy electricity from the grid to cover your usage at night and at times when the system’s production is lower than the usage in the house. A battery system can make a significant impact on the amount of solar power that you are able to use. However, you are still likely to need to import energy from the grid during the winter months and periods of poor weather. Is there any disruption when my electricity usage changes from the PV supply to grid connection? There is no disruption to your supply whatsoever. There’s no switch you have to turn or button you have to press. The changeover is done automatically, and the transition is so smooth that you won’t even notice it happening. The Total Generation Meter (TGM) will display the number of units that have been generated by the system since its commissioning date. The TGM is also where you can take the readings for your FIT. For a more detailed account of your system’s production, you will find that most inverters have an LCD display or a wireless connection where they show this information. There are also various monitoring systems that display a wider range of data in a user friendly format that you can add on to your solar system. What guarantees come with the system? PV systems installed by SunGift come with a five year workmanship guarantee as standard. Product warranties vary between manufacturers. Panels come with a performance guarantee over the course of 25 years and a product warranty of at least 10 years. Inverter warranties can be between 5 to 12 years and mounting systems are usually around 15. Better quality modules usually guarantee a lower rate of degradation and a longer product lifespan. Extended warranties are also available. Although most panels are guaranteed to last for 25 years (see above), realistically their lifespan will be much longer and they’ll still be producing usable electricity after 40 years. Although, after this time their performance will be notably lower than when first installed. It’s also important to be aware that the inverter may need replacing during this time. Most domestic sized systems come under something called “permitted development”, which means that as long as the system is installed according to certain criteria no permission is required. The criteria are as follows: 1) Panels should not be installed above the highest part of the roof (excluding the chimney), and should project no more than 200mm from the roof slope or wall surface. 2) The panels must not be installed on a building that is within the grounds of a listed building. 3) The panels must not be installed on a site designated as a scheduled monument. 4) If the system is wall mounted and your property is in a conservation area or a World Heritage Site, the panels must not be fitted to a wall which fronts a highway. If the system is ground mounted, or within a conservation area or national park, it’s also worth checking with the local planning authority. How much space do you need for a solar PV system? Generally speaking, for every 1kWp installed you’ll require about 5.6 square metres of roof space. Most domestic systems are sized between 3-4kWp, requiring 16.8-22.4 square metres of roof space. For those projects with limited space, it is possible to reduce the area to around 4.4m2 per kWp by using higher powered panels. Do solar panels have to be mounted on a roof? No. Solar panels have a range of mounting options, although roof mounted systems are the most common. Mounting them on a frame on the ground is also frequently used when the roof is not ideal. Mounting them this way will often achieve a better performance than roof mounting the system, as the pitch and orientation of the panels can be set so as to achieve an optimum yield. No. 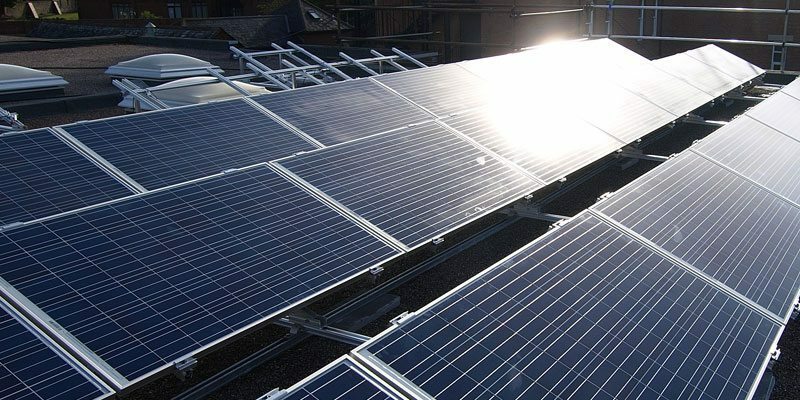 Although south-facing is the optimum orientation for solar panels in the UK, systems that do not face south can still yield high returns. A system facing east or west can produce as much as 85% of the electricity generated by a south-facing array. If the sun isn’t shining will I still get electricity? Yes. Solar panels are photovoltaic, and as such they do not need direct sunlight in order to generate electricity. However, production on a cloudy day will be less that on a sunny one. 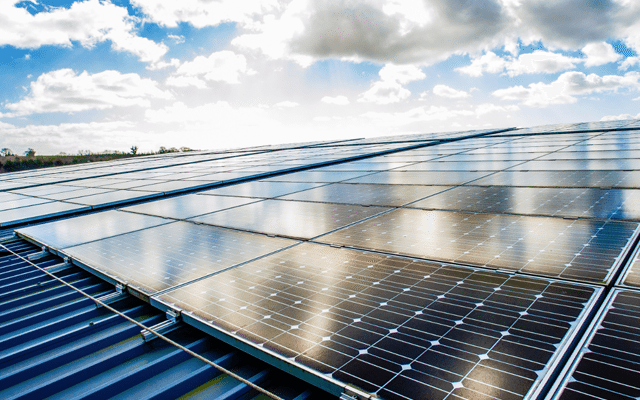 Although solar PV systems are designed to be “plug and play” we would recommend that a service is undertaken every 2-3 years or so, just to make sure the system is running to optimum performance. Most manufactures include stipulations in their warranties that require systems to have a periodic service check. It is also quite commonly suggested by industry bodies. Will the panels on my roof be damaged by strong wind or hail? As part of the MCS accreditation process all solar panels are required to pass wind and hail tests before they can be sold commercially. The modules that we supply have all been tested at levels that exceed the conditions found in the UK. When designed and installed correctly a PV system will cause no damage to your roof whatsoever. Depending on the size and complexity of the project it should take no longer than one or two days to install a domestic system. Not unless you are MCS accredited. In order to receive the FIT payments your system must be installed by an MCS accredited company. As a safety feature the inverter will not function if it can’t detect a voltage from the national grid. If this feature did not exist then the system would be able to export electricity back to the grid even during a power cut, endangering anyone working to fix the problem. Battery systems, however, can be designed to give you energy during a power cut. Can I spread the panels across two roofs? Yes. The panels are managed by an inverter system that usually has the ability to manage the data from panels on two roofs facing different directions (e.g. east and west). How long can I expect a system to take to break even? This will depend on a number of factors. However, we usually find that the payback period for a system can range from 6.5-12 years, with most systems paying for themselves after 8-10 years. Will a PV system add value to my house? From our experience this can be very subjective. When systems are designed and installed without compromising the character of the building we generally find that the addition of solar PV is a major benefit. After all, a 4kWp system can provide savings of about £600 annually. Who wouldn’t see that as added value?! What happens to the energy when I’m not at home? Any electricity produced by the system will fulfill the demands of the property as a priority. If this demand is met then any excess electricity will be automatically exported to the grid. If you have a battery system however, you can store any unused electricity for use later.